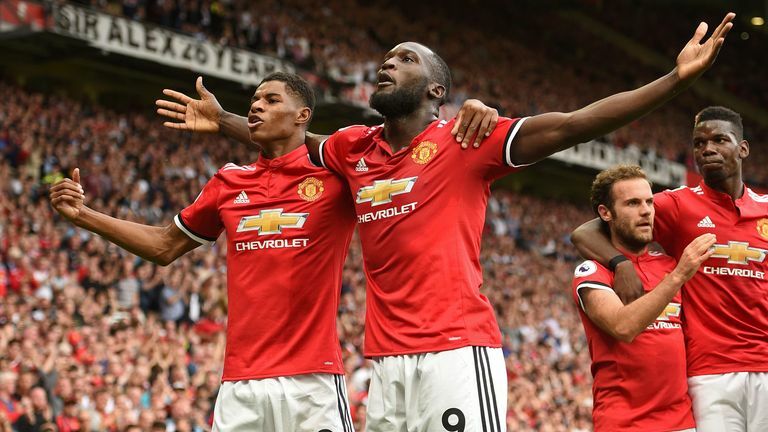 Thierry Henry praised Romelu Lukaku after his two-goal debut for Manchester United against West Ham on Super Sunday. The £90m arrival from Everton opened the scoring at Old Trafford on 33 minutes and netted again in the second half, with Paul Pogba and Anthony Martial also on the scoresheet in a 4-0 win. Henry believes Jose Mourinho now has a wealth of firepower to choose from this season and says United have “amazing” potential. But the Sky Sports football expert also warned Lukaku he has things to work on, chiefly in possession, after the Belgium international lost the ball 18 times against the Hammers. “He was close to a hat-trick, he scored goals we expected him to score, and there are bits he can work on,” Henry told Sky Sports. “But what a start to his Manchester United career. “The possession, this is the thing for me he needs to work on. He lost it 18 times and that is a tiny bit too much. Other than that he had an amazing start. He could have had a hat-trick but he did what he is supposed to do. “I thought Marcus Rashford had an amazing game. Gary [Neville] said it, the pace they have, the size they have, and today they put the ball in the back of the net.